Israel’s former Defense Minister Ehud Barak claims Israel was poised to bomb Iran several times in recent years but kept encountering internal government resistance. But this new report may just be part of a continuing game of geopolitical chicken, says Gareth Porter for Middle East Eye. 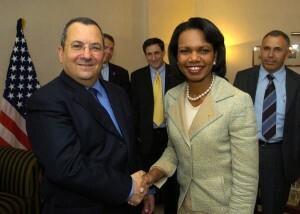 Both Barak and Ashkenazi agreed on the program, and moreover, that the Israeli army lacked the capability to carry out a successful strike against Iran without U.S. involvement. That agreement reflected a broad consensus within the Israeli security elite that Israel could not carry out a successful operation against Iran without the full involvement of the United States. That diplomatic exploitation of the Israeli threat came seven months after Haaretz reported in May 2009 that CIA Director Leon Panetta had just obtained a commitment from Netanyahu and Barak that they would not take military action without consulting Washington first. That commitment reflected a reality that most senior national security officials accepted – that Israel could attack Iran without U.S. cooperation. Can consortium news do some research into the jewish (neocon) banking industry….The life blood of any “movement” must be financed…..To kill a cancer you cut off it’s blood supply….To kill a “movement” you kill the money supply….Has anyone noticed Obama’s heavy hand in financial sanctions. The answer is not where the sanctions are but where they are not……biting the hand that feeds you……don’t delete this post !!! The republicans should be indited under the Logan Act for their treason and flagrant abuse of constitutional law. The congress is not entitled to rewrite the terms of treaties. It’s illegal and following the vote requires prosecution for their treason. Weve heard BS arguments just like Benny’s by G.Bush and WMD’s in Iraq. The goy are not going to fight this war for Israel. What more serious is Congress is challeging presidential autority and they have no consitutional authroity to do so or to challege the president. This is an illegal act. Never miind the fact Constitution Intregrety is at it’s absolute low point. With idiots like Hackabee campaigning for funding in Israel. The banklash needs to be swift and extreme. Do we have a false democracty, hiding a Zionist fascist state??? There is no border. Logistically, an Israeli attack on Iran is an impossibility. Israel could bait and provoke Iran through aggression toward Syria and Lebanon and that is what they are doing. Iran may or may not take the bait. Of course I have no way of knowing whether or not Mr. Porter’s thesis is right or not, but it surely does sound plausible. Based on everything I know, Israel had no ability to do more than whack a hornet’s nest in Iran. Almost ever one of the possible outcomes ended with that crappy little nation being the eventual loser, or they’d have tried an attack, IMO. Constantly making threats must have been profitable though. No telling what coin the BHO Administration used in paying them off. God’s Chosen People since 6000 BC. What other nation could divulge this type of information, and get away with it. Only our dear old Middle East ally Israel can do whatever it wants, at anytime it seems fit. Do you want to see peace in the Middle East? Well when the United States finally decides to quit defending Israel with the power of the U.S. veto, then and only then will the world see a peaceful Middle East. This craziness needs to end, and end soon. Israel is a disaster of a nation. Americans including Jewish Americans should put our foot down, and throw this Israel nation state to the wind. Giving the Jews a nation in theory sounded like a good idea, but then did anyone ask the Palestinians how they felt? No, because they didn’t have the money and influence that the Zionist have, so tough luck for them. In support of the deal, good cop Barack himself is still peddling that same warmed-over, patently false tale of near war-war with Iran.